The Notes from Nature project has been running for almost two months already and we are still just excited as the day we launched. The community has been great and we have received some amazing support and feedback from many of you. We are actively working to expand our collection coverage and hope to keep you all entertained through all the beautiful summer evenings ahead of us. 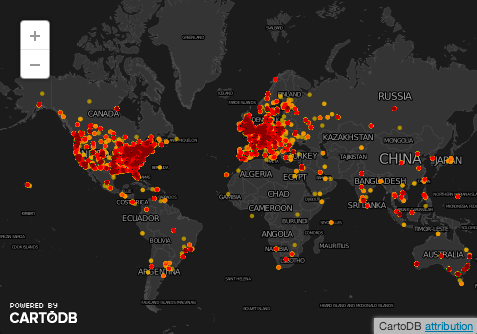 With that said, we thought it would be a nice moment to take a look at some of the trends of our community. This serves a both a peek behind the curtains as well as a sort of snapshot that we can return to in the future to see what has changed and how we improve over time. We had the idea for this post since the day we flipped the switch and made the site live. We all knew that the first hours of the project being live were going to get some of the heaviest traffic we would experience. We wanted to do a little analysis of how that traffic came and left the site, we collected a small set of data over the first five days of the project in order to look at this. First things first, take a look at global the Notes from Nature contributors were over just the first five days (click to see in interactive map)! We see the expected, early gains in user numbers followed by a slower accumulation later in the week. After the really early spike in transcriptions that came with all the users, we saw a nice continuous growth of total transcription activity through the week. 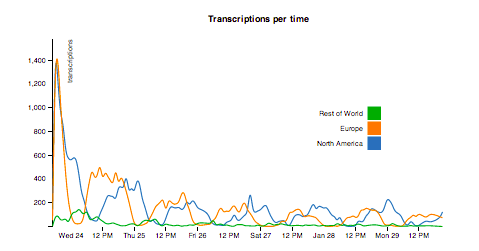 We thought it would be pretty neat to look at the transcriptions coming in at different times of day from our two primary regions, North America and Europe. The above graph’s X axes is in EST, so you can see a nice rhythm to the Notes from Nature transcription. We really like this graph and will love to see it play out over the course of a year or more! We built the above graphs with D3 and CartoDB, if you click on them you can see each one and take a look at the code used to create them. So how is Notes from Nature doing more recently? 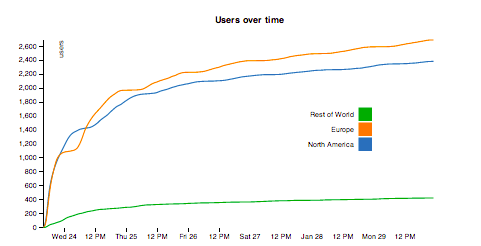 Well, in the first five days we had around 5000 unique participants. In the past two weeks we have had just over 3200. Not bad! Projects like Notes from Nature usually get a lot of members early that don’t end up sticking around, but we have done well to keep them or create new ones over the small time period. Our biggest audiences are still overwhelmingly in the USA and UK. Right now, we are averaging 1400 classifications per day! As we improve the interface and add new and interesting components to the mission, we think we can see a growth in this number, but we are really happy with it so far. We have completely finished, including replicate transcriptions, 12% of our records in only two months! We will have more records in the future, but hopefully we will have a bigger community working with us too. 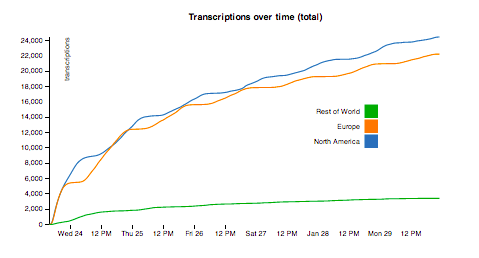 We are closing in on 200,000 transcription, which is going to be an amazing achievement. Thanks to all of you who are helping us do something amazing for biodiversity research, museum informatics, and science! It’s interesting to me that there are more Europeans and more transcriptions from Europeans even though most of the locations are in the United States. I’m not sure I would have the dedication to stick with the project with many unfamiliar locations! When I get bogged down with several in a row outside of my comfort zone of the States I admittedly get frustrated and will tend to end a session on a foreign one. Some of the Costa Rican butterflies are real charmers, though. If you look at a ‘rank/abundance’ type plot of the number of contributions by each transcriber that treats the transcribers as ‘species’, do you see a few transcribers that are doing a large number of transcriptions?